The term paracrine refers to a secretion mode of glandular cells, where their products are delivered to interstitium of their proximate environment. Tissue hormones and cytokines have a predominantly paracrine action. Additionally, some endocrine cells like pancreatic beta cells or cells of anterior pituitary gland are secreted in paracrine manner (in addition to their classical endocrine effects). Typical control patterns of paracrine secretion are lateral inhibition and ultrashort feedback. 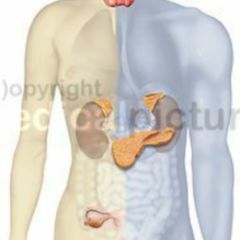 Endocrinology is the science and clinical speciality of endocrine, and in a broader sense paracrine secretion.